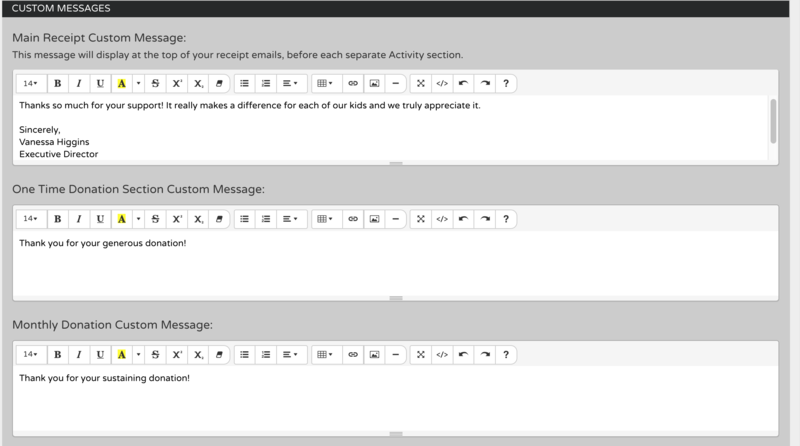 Flipcause automatically generates email receipts with a generic but personalized thank you message. legally-required information: financial and tax-deducible information, contact details for your organization and EIN, and the tax-deductible disclaimer. We always recommend customizing the receipts further to put your organization's branded touch on them. You probably already an existing template for your thank you letters, which you can definitely set up in your Flipcause account and campaigns. You can customize the automated email receipts that get sent to your supporters per campaign by going to Campaigns > Edit This Campaign > Receipt Settings > Transaction Receipt Settings. Specify the sender (from) email address, the subject line, the greeting, and whether you'd like to use the first name or full name of your supporter in the greeting. Note: Using a Yahoo, AOL, and Hotmail-hosted email address will not work and will block all of your email receipts and confirmations from being sent out. Please be sure to use an email address that is hosted by another provider. You can change the subject line for the emailed receipts as they appear in your supporters' inboxes. You can choose any greeting you'd like, such as "Dear" or "Hello" as well as pick whether to address your supporter by first name or full name in the Name Preference drop-down. This allows you to pick the appropriate level of formality or casual tone for your relationships. Your auto-generated thank you receipt will contain a top portion that addresses the transaction as a whole, and additional portions below that outline the details of each activity that occurred during this transaction. The main message will be the first text your supporter will see after the greeting, and before the tax deductibility disclaimer and the transaction details. You have the ability to set a custom message for both the main, top area, as well as customize messaging for every part of that transaction. You can set up a unique message for every type of supporter activity, or copy and paste the same message to all. The tax-deductible disclaimer comes pre-filled with the standard legally-required disclaimer: "No goods or services were provided in exchange for this donation. All donations to 501(c)3 organizations are tax-deductible as allowed by law. The amount listed is your potential tax deductible amount. As with any donation, you should consult with your personal income tax adviser about your particular tax situation." Here you can choose the wording of your tax deductibility disclaimer, as well as choose, how or if it appears. This is great for campaigns or activity types in a campaign that are not tax-deductible. NOTE: You are welcome to change or add to this disclaimer, but please be advised that you may be held legally liable if the custom text entered here doesn't meet legal requirements. Be sure to verify your messaging with your attorney (Flipcause is not licensed to provide legal advice). After configuring your receipt settings, you'll want to first preview what it looks like to make sure everything is correct. Make sure to first click SAVE to save your settings, then click on Send Test Receipt to preview what your receipt will look like. Since you have formatting and image options in your custom message body, this is a good opportunity to make sure everything is formatted correctly! If your campaign includes a Recurring Payments option, you'll also want to customize your recurring payment receipt (also within Campaigns > Edit Campaign > Receipt Settings). This receipt is not for tax purposes and provides a summary of the recurring payment details, along with a link to edit the donation in the future. 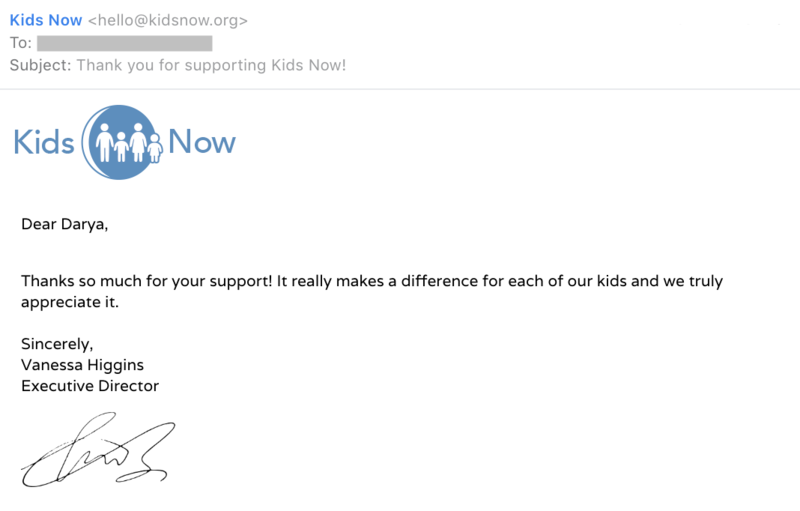 You can customize the subject line, write a short message, and set whether the tax-deductible details are included.